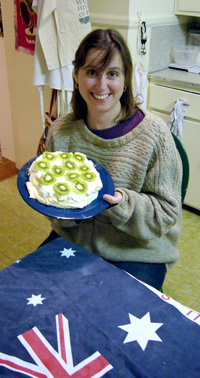 As we all know, there is some dispute over whether New Zealand or Australia invented the pavlova. In the spirit of détente, we made one for Australia Day but topped it with kiwifruit. Beat the egg whites to peaks, beat in sugar slowly and cornstarch until glossy, fold in vinegar, scrape into a round on parchment and bake 250°F for 45 minutes. Cool and top with whipped cream and kiwifruit. Yum. My previous pavlovas had been crisp on the outside, but always somewhat collapsed under their shell. This one was softer and fluffier; there’s a good case to be made for both, but I wish Cook’s Illustrated would send in the cavalry and sort the pavlova out once and for all. This entry was posted in Culinary Escapades on 27 Jan 2007 by Mike.